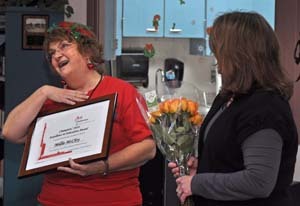 Kindergarten teacher Millie McCloy was taken by surprise Thursday morning when she was recognized with the Champions Excellence In Education Award. Champions’ area manager, Stephanie Roberts, used the occasion of the Berthoud Elementary teachers’ breakfast to make the presentation. McCloy teaches kindergarten classes at the school, but is employed by Champions®, an organization that provides extended learning experiences. McCloy provides the extra half-day of kindergarten teaching that brings the class time to a full day. She provides morning instruction for the afternoon class and afternoon teaching for the morning class. McCloy said she loves working at Berthoud El. She commented that, even though she is not a district teacher, that the staff and other teachers at the school treat her as one of them and make her feel like she belongs. That feeling was evident when all the teachers stood and gave McCloy a round of applause at the end of the presentation and remarks. Principal Camilla LoJeske told the gathered teachers that McCloy “… uses her creative talents to enhance her children’s educational experience.” She described Mrs. McCloy as a giving caring individual and said the award was well deserved. After breakfast, many of the teachers stopped by McCloy’s table and to add their well wishes and tell her they too thought she deserved the recognition. McCloy grew up on a farm in central Kansas and knew she wanted to be a teacher. She did teach for many years and then retired. This latest adventure began five years ago when she took her grandson to a Champion’s class at an elementary school in north Loveland. She found the class disorganized and in shambles. When she asked why, the teacher said she was the manager just filling in and desperately needed a teacher. She asked McCloy if she knew of any retired kindergarten teachers. McCloy showed how her arm slowly went up and within the week, she was teaching again. 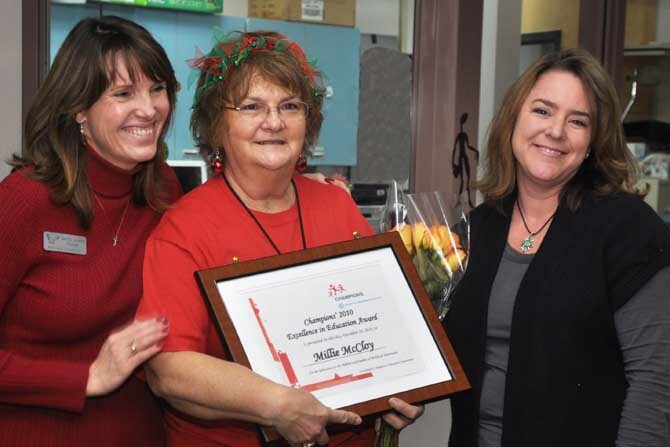 A measure of the esteem that her colleagues hold for her is that even after the district implemented full day kindergarten; Berthoud Elementary chose to stay with Champions and Millie McCloy. Parents of children who attend full day kindergarten, whether provided by the district or by Champion, pay an extra fee for the added class time. In addition to the enhanced learning programs, Champion also provides before school student activity from 6 a.m. until classes begin and after school until 6 p.m.
Berthoud Elementary principal Camilla LoJeske joins with Champions area manager Stephanie Roberts to congratulate Millie McCloy on her well deserved award. Ms. Roberts, the area manager provided the following information about Champions and about the award the Mrs. McCloy received. For eight years, Champions has recognized teachers who provide excellent service to children and families. These teachers are effective communicators, flexible in meeting family needs and demonstrate warmth and humor with the children in the classroom. The Excellence In Education Award recognizes the outstanding contributions made to the Champions program. Award winners are selected from a pool of nominees, and represent the top-performing instructors from the Champions program. Champions®, is the nation’s leading provider of extended learning, enrichment and targeted academic intervention solutions that address specific school and community needs. Champions provides more than 600 before-and after-school programs, summer camps and academic science programs to primary and middle schools nationally. These initiatives are offered at more than 600 sites in 20 states, serving nearly 55,000 students annually. Champions® is a division of Knowledge Universe-US®, a leading private provider of early childhood and school-age education and care. Champions’ main office is located in Littleton, Colorado. For more information about Champions programs call 800-246-2154 or visit www.discoverchampions.com. Site contents copyright © 2019 Recorder Online	except as noted. All rights reserved. | 89 queries in 2.272 seconds.